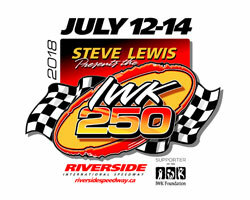 Thirty-seven top teams have filed entry forms to compete in this year’s IWK 250 presented by Steve Lewis, the highlight of the IWK 250 Super Race Weekend set for July 12 to 14 at Riverside International Speedway. The impressive expected entry list features drivers from six Canadian provinces and two U.S. states and includes five IWK 250 champions, four Parts for Trucks Pro Stock Tour champions, two Speedway 660 pro stock champions, one PASS North SLM champion, and Kenny Wallace – one of NASCAR’s top personalities and a member of the FOX Sports Racing NASCAR broadcast team. Before Wallace retired from NASCAR racing in 2015 he made 905 starts in a 25-year career with NASCAR’s top three series scoring nine wins in 547 NASCAR Xfinity Series races – one of which came at Bristol Motor Speedway in Tennessee which Riverside International Speedway is modeled after. Since his retirement from NASCAR racing, Wallace has become an accomplished dirt car racer with his most recent win last Friday at the UMP DirtCar Summit Modified Nationals at Terre Haute Action Track in Indiana. He still races a handful of asphalt tracks each year and Riverside is on the bucket list for 2018. Wallace, driving the Cat Car for Kids out of Antigonish’s Nova Racing stable, will attempt to become the second IWK 250 celebrity driver to win the event, with only Regan Smith having achieved that honour in 2008. But he’ll have to beat a talented field all looking for the checkered flag and accolades that go with being an IWK 250 champion, including a guaranteed $10,000.00, a custom-made champion’s trophy, and seeing their name engraved on the coveted John W. Chisholm Memorial Cup – the perpetual trophy for the event which memorializes the late John W. Chisholm, founder of Riverside International Speedway and co-founder of the IWK 250. Two NASCAR Pinty’s Series drivers from Ontario have entered the IWK 250, Jason Hathaway and J.R. Fitzpatrick, both with multiple wins on Canada’s only national touring series. Fitzpatrick will be looking to back up a win in his only other super late model/ pro stock start at Riverside in a 2014 150-lap race. IWK 250 champions on the expected entry list include Dylan Blenkhorn (2017), Donald Chisholm (2016), John Flemming (2012, 2014), Ken Vincent (2010, 2015), and Darren MacKinnon (2011). Parts for Trucks Pro Stock Tour champions who have entered the event include Cole Butcher (2016), Chisholm (2015), Flemming (2002, 2003, 2006, 2013, 2014), and Shawn Turple (2009, 2012, 2017). Other super late model champions in the field include Dave O’Blenis and Greg Fahey, both titleholders at Speedway 660 (Geary, NB) and Cassius Clark, the 2013 Pro All Stars Series champion. And, if they win the IWK 250, either Clark or Craig Slaunwhite will make Maritime stock car racing history by winning the Triple Crown, which encompasses the region’s three 250-lap events. Several other drivers from throughout the Maritimes on the entry list are not only looking for but capable of, getting their first win in the IWK 250. The IWK 250 is the first extended length stock car racing event of the season in the Maritimes and a championship points event for the Parts for Trucks Pro Stock Tour. Atlantic Tiltload Heat Races and a B Feature will set the anticipated 30-car starting field for the IWK 250. Heat races get underway July 14 at 3:30 p.m. followed by the B Feature, a pre-race show with an autograph session and live entertainment, the opening ceremony, and the IWK 250. Grandstand gates open at Noon. Top Sportsman drivers have entered the July 13 Henry’s AUTOPRO Sportsman 150 including NAPA Sportsman Series champions Frank Fraser, Jr., Colby Smith, Russell Smith, Jr., Aaron Boutilier, Chris Reid, and Shawn Waterfield; Smith has won the last two editions of the race and looking for three-in-a-row. The list of expected entries for the Maritime Legends Challenge, also on July 13, features drivers from Nova Scotia, New Brunswick, Prince Edward Island, Newfoundland, and includes defending race winner Cory Hall and defending series champion, Waylon Farrell. A complete list of expected entries to-date for each of the three races at Riverside on July 13 and 14 can be found by visiting the event pages on this site; teams can enter right up until race day so more drivers could be added. Advance tickets are available for the IWK 250 Super Race Weekend here and will be available at the gate on the day of the events. The IWK 250 Super Race Weekend kicks off Thursday, July 12 with IWK 250 Test Fest and a Tailgate Party featuring Canada’s east coast acoustic party band, Signal Hill. On Friday, July 13 it’s the Henry’s AUTOPRO 150 for the NAPA Sportsman Series and the Maritime Legends Challenge for the Maritime League of Legends. Saturday, July 14 it’s the IWK 250 presented by Steve Lewis. Anyone planning to camp at Riverside over the IWK 250 weekend who does not have a confirmed campsite can have their name added to the waitlist by using the form found in the ‘Order & Pay Online‘ section. The track camping areas are full but management is hoping to secure more space. All campers (RVs, tents, etc.) require a permit to park overnight on Riverside owned or operated property from July 10 to July 16. The Parts for Trucks Pro Stock Tour (PST) is considered the highest level of stock car racing in Canada and recognized in the industry as one of the healthiest stock car racing series in North America. PST visits four tracks throughout the Maritimes during its May through September season. The Parts for Trucks Pro Stock Tour is owned and operated by Maritime Pro Stock Tour Limited. For more information, call 902.481.2531, click www.maritimeprostocktour.com, or follow on Twitter at www.twitter.com/prostocktour or Facebook at www.facebook.com/prostocktour. Riverside International Speedway is recognized throughout North America as a top stock car racing venue. Founded in 1969, the family-friendly facility boasts a 1/3-mile high banked asphalt oval which roars to action several times a year for thrilling door-handle-to-door-handle special events including the IWK 250, widely known as the most anticipated stock car race in Canada – and the Bumper to Bumper 300, eastern Canada’s only NASCAR Pinty’s Series event. Located in James River, between New Glasgow and Antigonish, the facility is easily accessible at exit 30 on Trans Canada Highway 104. For more information please visit www.riversidespeedway.ca or call 902-863-2410.